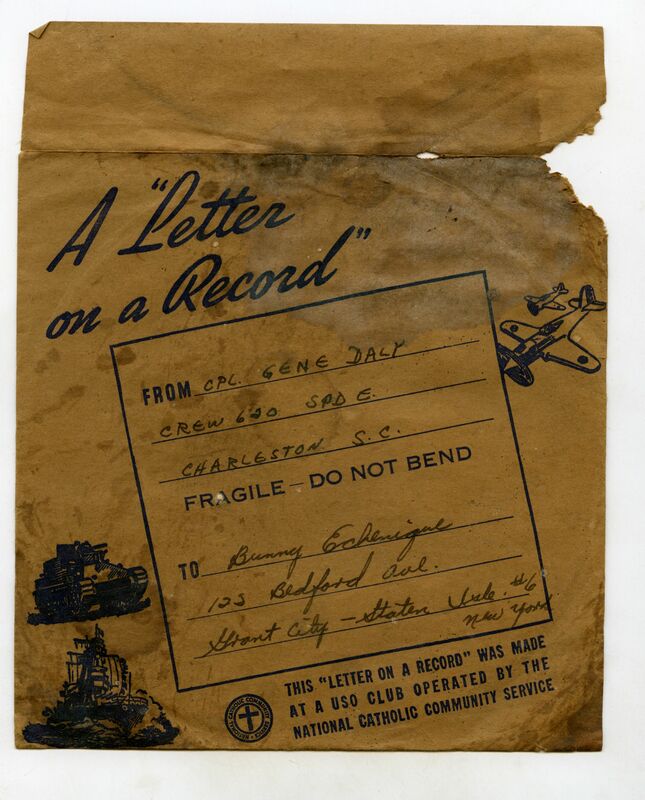 A Voice From the Past – WWII ” Letter on a Record” Digitized! I have to admit that this is a first for me. 99% of my posts have been dedicated to photos mixed with the occasional letter and/or youtube video. This is the first time I’ve digitized a WWII record! The process was incredibly laborious and the results were scratchy and hard to listen to. Given the condition of the record as well as the limited audio digitization available, I think I did a decent job. 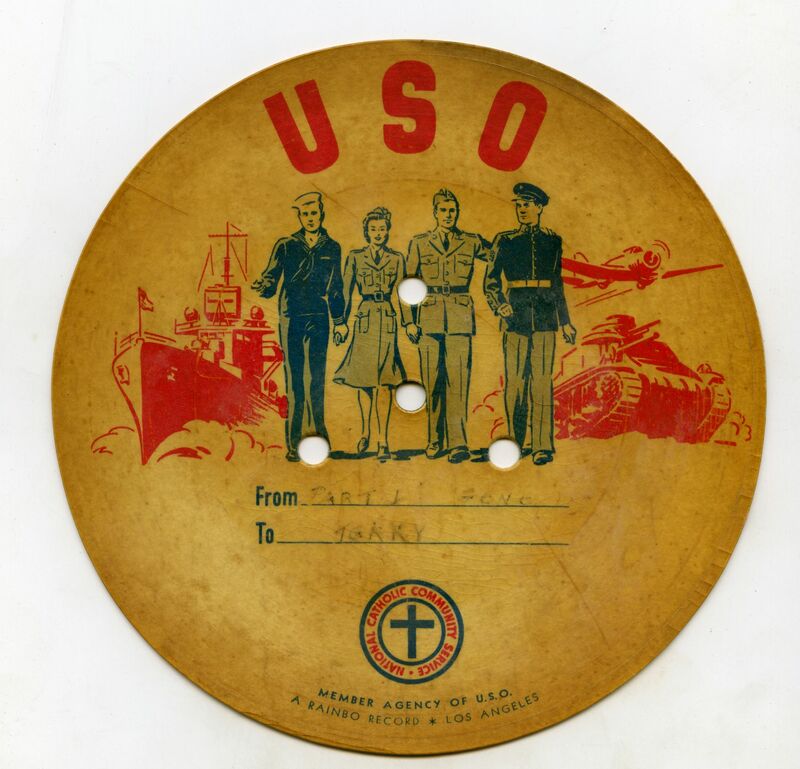 Here’s the story – I purchased a set of WWII “Letter on Record” wax and paper records produced by the USO in WWII. They were put out by the USO in affiliation with organizations such as the National Catholic Community Service. According to my research, over 350 recording booths were available during the war with a total production of 350,000 +/-. They were printed on wax and paper records using a recording booth where the sitter would talk while the machine “cut” their voice into the record. They were then sent home to be listened to by loved ones. I can’t imagine they were made to survive 70 years, but these two copies remain in decent condition. I purchased them for $1.50 each at a local flea market. The discs were recorded by a Eugene “Gene” Daly who was stationed at an Army Air Corps base in Charleston, SC during the war. He was a member of Crew 620 of Sub Unit E. I’m not entirely sure what this group did but it may have to do with sub patrol on the East Coast. It was sent to Bunny Echenique of 122 Bedford Ave, Grant City, Staten Island, NY in February of 1945. I played the disc on my record player at 33 speed and held my iPhone up to the speaker and recorded what played. I could hear a slowed down version of human speech so I knew that the process was working. From there I sent the audio file to my computer where I fiddled with Audacity to tweak the speed. I was able to speed up the voice by 1.6X. A voice from 70 years ago played on my speakers. From there I created a video with the actual record as the visual and posted it to youtube. Listen for yourself! I still have a few additional sides to record, but this one gives you the general feeling of Gene Daly’s “letter on a record”. ← WWII Photo Negative – German Prisoners Captured in Munich, May 1945 – Event Captured on Film! Thanks for this great post! My mother still has a couple of these that my Grandfather created while in England during the war. I recorded them to a cassette tape back in the 80’s. Had a record player that would play at 78rpm back then. I need to digitize them now and your tech notes should come in handy. Glad to help! These are really incredible pieces of history and are not readily collected or appreciated. I’m glad I’ve been able to help out! If you need other tips or tricks let me know – these records are fun to discover! We just discovered 4 of these records in my grandparents house while cleaning it out. 2 of them with my grandpas voice from 70+ years ago and 2 with his brothers voice. They are just amazing to listen to! That’s awesome! If you can record them on an iphone and send them to me, I wouldn’t mind posting them here on my site for the world to listen to! My mother died June 2015 at almost 94. In cleaning out her house, I also discovered a record that was from my dad while he was still in boot camp before being shipped overseas. It played at 78, but was faster than it should have been. It wasn’t his voice, but I could at least understand what he said. I am 73 now and my dad would have been 97. Before my demise, I want to hear my dad’s natural voice. I am not a technical person and I do not think I can do what is stated above. Isn’t there some place I can take the record to have the speed reduced and then place on a CD? I also found a shoebox of letters that my dad wrote to my mom during his overseas tour. Nancy – do you have an iphone or a way to record the record on a player? Any ideas on how to get a very deteriorated disc to play si that it can be digitized? Go one that my dad had made at Ft. Riley. Just can’t get a audible sound. Thank you. Play it on a conventional record player and record the sound with an iPhone. Then download the sound to a audio editing program on your computer and tweak it until you can hear it. Thank you for this information. I recently came across one of these records my father sent to his mother in July of 1943. He joined the Marines at age 17, with parent permission, and was an enlisted pilot flying a Corsair. I would love to hear his voice on this record! Do you have access to a record player? Yes. My 23 year old daughter, who loves records, purchased one a few years ago. I’ll see what we can come up with this weekend. It will play at a strange speed, but if you record it with an iphone you can use various websites to slow it down or speed it up to get the correct sound.